Manufacturer & Exporter of Brass Ceramic Cartridge. 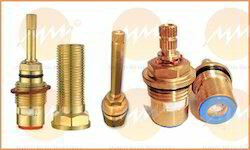 Our product range also comprises of Ceramic Valve and Brass Sanitary Fittings.we make sure that the consignments are timely delivered at clients' destination using easy modes of transportation. Owing to our vast manufacturing facilities, we are manufacturing, supplying and exporting Brass Ceramic Cartridge. Our range is manufactured using high quality material under the close supervision of our experienced professionals. Besides, we make sure that the consignments are timely delivered at clients' destination using easy modes of transportation. Looking for Brass Ceramic Cartridge ?